Mega Construx Jumbo Pikachu | Nerd Much? Are you a fan of the awesome line of building toys from Mega Construx? Well you should be, because these awesome Lego-like buildable collectibles bring the joy of creating and building to kids of all ages. 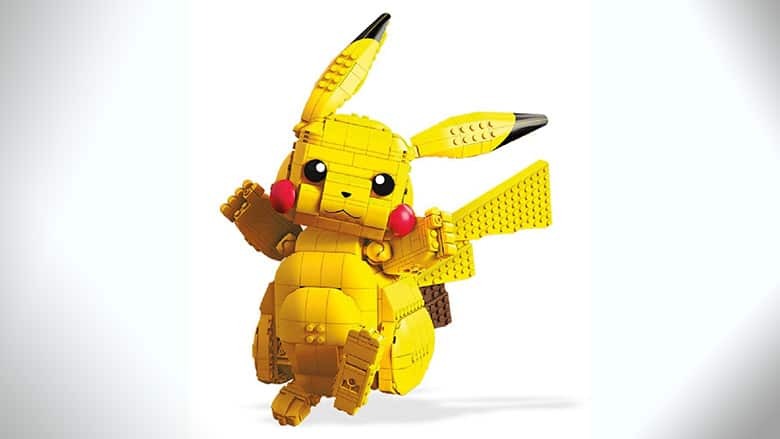 With tons of options available, it is easy to get excited about all the sets already out there, but now the toy company is releasing yet another awesome reason to start collecting: the Mega Construx Jumbo Pikachu. The newest addition to the line of Mega Constux is the perfect gift for Pokemon fans of all ages. It’s a jumbo buildable Pikachu that’s now available for preorder (it’ll ship in September), and you are definitely going to want to add this Pikachu to your collection. The result of this kit is a 12-inch poseable Pikachu. This jumbo Mega Construx Pikachu stands 12.6 inches tall and weighs about 2 pounds. With Articulated arms, legs, tail, and ears, this Pikachu is ready to be posed in all your favorite electric type moves. Collect other characters in the Pokemon line of Mega Construx and build them all, to create your favorite epic Pokemon battles. It’s suggested for ages 8-12, but if you’re looking to add to your collection, we totally wouldn’t judge you. This adorable Jumbo Pikachu is just too cute to pass up.